President Xi Jinping greets President Donald Trump at a welcoming ceremony in Beijing, November 9, 2017. Trump was on a five-country tour of Asia. China and the United States Are Equals. Now What? Donald Trump’s Asia trip was historic in one respect: it belatedly focused American attention on the competition between the United States and China for global primacy. 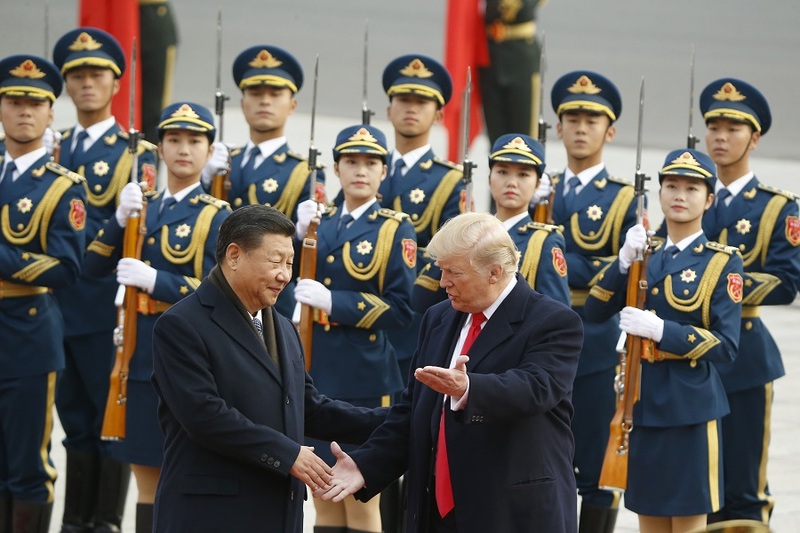 China has risen, the era of uncontested American leadership has ended, and any American with a television set now knows it—thanks to the media’s proper framing of Trump’s and Chinese Communist Party Secretary Xi Jinping’s activities in Beijing and Da Nang, Vietnam. In those cities, the two men were treated by media as equally authoritative as they laid out disparate visions for the future of the eastern hemisphere. It seems we are no longer number one. It’s a tie, for now. Most U.S.-China frictions since 1979, whether over intellectual property, currency valuations, or human rights, have been limited to the bilateral relationship. The two nations now compete to shape the world order by having their values and policies accepted on the global stage. In the South China Sea, the question is not so much who should have sovereignty over which rocks and reefs as whether international law or great power prerogatives should settle such questions. In trade and investment disputes, the issue is how nations should view openness, reciprocity, and multilateralism on one side and protectionism on the other. In the cultural, media, and civil society spheres, the core difference is how to weigh the interests of states against the freedom of groups and individuals. To prevail in this contest, Beijing and Washington must legitimize their preferred practices by strengthening partnerships and alliances, providing global public goods, building multilateral institutions, and enhancing their soft power and economic relations worldwide. Such assessments may reflect as much dissatisfaction with Trump as admiration for China’s achievements. That said, Xi encourages such comparisons through timing some of his speeches to emphasize the contrast between his paeans to globalism and the nationalistic rants of the American president. His January 2017 speech at Davos, delivered days before Donald Trump’s inauguration, was widely interpreted as a declaration that China was willing to uphold the world order if the United States no longer chose to lead it. At the 19th Party Congress 10 months later, Xi upped the ante, proclaiming China would take a central role on the world stage and offer a model for other nations’ emulation even if the United States still sought leadership. America’s withdrawal from the Trans-Pacific Partnership (TPP) international trade agreement and the Paris Climate Accord in the period between Xi’s speeches made China’s aspirations seem credible. Was the Trump-Xi Summit in Beijing a Hit or a Miss? Under Xi, China has launched major regional institutions like the Asia Infrastructure Investment Bank, built its first overseas military base, and invested in infrastructure across Eurasia and Africa. With the world’s largest middle class, trading regime, and foreign currency reserves, China’s growing strength across most indices of what it calls “comprehensive national power” (国家综合实力) demands adjustments to the security architecture in the Western Pacific and reevaluation of America’s strategic doctrines. The authoritarian political system of the Chinese Communist Party (C.C.P. ), however, ensures that China’s institutional and ideation influence will remain largely unwelcome beyond its borders. The very Chinese model Xi celebrated at the 19th Party Congress will hamper China’s ability to lead the modern world even if the nation’s power continues to grow. Before reviewing factors that cast doubt on China’s capacity for leadership, it is worth asking whether China truly wants to lead the multi-faceted global system. At Davos and Da Nang, Xi was careful to speak only of “economic globalization”; he made no mention of globalism’s political, security, cultural, or normative aspects. He argued that China’s ancient glory and recent success qualified it to lead the trade regimes that have enabled its rise, but went no further. Xi’s China stood ready, in other words, to lead homus economicus in its quest for material and technological well-being—he calls it the “Community of Common Destiny”—but not to uphold established values or institutions that advance the rule of law, the free flow of information, representative government, and the social, cultural, and political pluralism that are as much features of international modernity as open markets and the global supply chain. This is a serious limitation to China’s global vision—not so much a blind spot as the lack of an entire eye. Moreover, Xi was offering to lead a global economic system whose principles China frequently violates: its real-world performance undermines its pretensions to leadership. China’s high tariffs, non-tariff barriers, relatively closed economy, theft and coerced transfer of intellectual property, promotion of national champions, and willingness to use trade to punish partners for political sins—demonstrated in bans of banana imports from the Philippines and of rare earth exports to Japan, and in economic attacks on South Korea following Seoul’s deployment of the anti-missile system THAAD—belie Xi’s professed commitment to economic openness. Despite his confidence, broadcast at the 19th Party Congress, that “Chinese wisdom” can guide the world, Xi has yet to advance serious solutions to global problems. “It is war, conflict, and regional turbulence that have created” the refugee crisis, Xi said at Davos, “and its solution lies in making peace, promoting reconciliation, and restoring stability.” This nugget of Xi Jinping Thought proves that he knows what an antonym is, but no thinking person would regard it as policy guidance. Xi’s refugee riff reminded me of a discussion I had with a Chinese international relations scholar in 2014. The scholar asked what I thought of Xi’s new proposal to end conflict in the Middle East. I said I didn’t know he had made a proposal and asked what it was. “Chairman Xi thinks there should be peace,” he said. The absence of regional support for Chinese leadership—indeed, the region’s deep distrust of China’s intentions—is glossed over by the diplomatic theories of Chinese scholars. Xi’s claim that “invading other countries and seeking hegemony are not in the genes of the Chinese nation” and his assurances that China will be a benign power are rooted in China’s “Tianxia” (天下) and “Kingly Way” (王道) discourses. Tianxia theory holds that Chinese preeminence will result from the grateful, voluntary obeisance of foreigners who find their own civilizations inadequate. Under the Kingly Way, in contrast with the “Way of the Hegemon” (霸道, or the “American Way”), the dominant nation is granted deference in recognition of its benevolence and superior virtue, and therefore has no need to impose its will through violence. These ideas have few subscribers in Southeast Asia, where views of Chinese hegemony are based not on Xi’s racial genetics, but on China’s build-out of the South China Sea and rejection of the 2016 decision of the Permanent Court of Arbitration, which debunked the rationale for the build-out through the clearest and most final means available to international law. China, writes the Singaporean diplomat Bilihari Kausikan, “does not merely want consideration of its interests. China expects deference to its interests to be internalized by ASEAN members as a mode of thought.” In other words, the price of benevolence under the Kingly Way is the subjects’ surrender of mental autonomy. Despite China’s desire to have its superiority acknowledged, there is little evidence that the country is ready to take on the costs of leadership. Modern hegemons must uphold rules that work for all nations, large and small; they frequently subordinate their interests to those of the global system; they ask their citizens to spend money and die far from their shores, and they take high-risk actions on short notice with inadequate information, for which they are often resented. Chinese political culture abhors these unavoidable aspects of leadership. The Party has always described its foreign policy to the Chinese people in highly moralized terms. China’s special characteristics and history of victimization, the story goes, make it immune to the selfishness and rapacity that animate other powers. China seeks harmony, is concerned only with its own welfare, is respectful of all beliefs and political systems, and never interferes in the affairs of other nations. This catechism has been hammered into China’s collective conscious for so long that Beijing now faces vocal online opposition to its spending on foreign aid. Why, netizens ask, should China help poor foreigners when nearly 500 million Chinese get by on less than $5.50 per day? China is proud of being the largest provider of U.N. peacekeepers, but when several of its soldiers returned from South Sudan in body bags in 2016, netizens protested that African peace was not worth Chinese deaths. China is unlikely to take up true global leadership during Xi’s second five-year term. China’s domestic challenges—Xi defines the “primary task” as “satisfying the people’s increasing demands for a wonderful life in the face of incomplete and unbalanced development”—make continued, gradual advances in regional influence the probable choice for the nation. With an intimidating domestic docket, China’s assertion of its prerogatives through military intimidation and checkbook diplomacy will not cease, but they are unlikely to accelerate unless China feels provoked, or unless it is handed opportunities too good to pass up. China will also continue to invest in soft power to increase its global prestige and scope for action; and in discursive power, which attempts to use media to tell China’s story and have it accepted on its own terms. And yet, China’s state-regulated culture has limited appeal within its own borders and no audience beyond them, while foreigners rightly view Party media as propaganda organs. China’s conceptual problem with soft power is more profound and paradoxical. Because the Party believes that only authoritarian governance can provide domestic stability and economic development, it has adopted and become acculturated to secretive, repressive modes of governance and styles of communication. When China employs these domestic practices on the global stage, it repulses foreign audiences—even those that welcome Chinese investment. The Party understands this, but cannot adopt a casual tone or engage in open dialogue abroad while retaining hardline policies at home. Too many Chinese interact with the outside world to tolerate double standards. So Beijing is stuck. China’s theory of governance precludes its global leadership. Xi cannot alter that the international stage on which he wants China to take a central role already hosts actors and audiences steeped in skepticism, irony, irreverence, logical argument, raucous debate, the calling out of nonsense, and the critical interplay of ideas, all of which are forbidden in Chinese public discourse. “The leader of an open system must itself be open,” writes Kausikan, “and the Chinese Communist Party is concerned that further liberalization may jeopardize its rule.” China’s influence can continue to grow under these conditions—indeed, China may thrive—but leadership of the sort the U.S. has exercised since World War II is beyond its grasp. Despite Xi-ist triumphalism, China’s ability to lead the global system remains poor, while the United States, although weaker in relative terms than it has been at any point since 1945, still holds an enviable hand. True, Trump’s instincts incline him toward withdrawal, but there is reason to postpone despair. His desire for “wins” and admiration may yet spur policies conducive to global leadership if he can be convinced to broaden the geographic scope over which America’s Greatness or his personal charisma unfolds. Facts, too, may force an appreciation for America’s global interests upon him. As I wrote in ChinaFile in January, “Sooner or later, and the sooner the better, Trump is bound to rediscover the strategic rationale for the Rebalance to Asia.” His recent promotion of a “free and open Indo-Pacific,” half-baked and half-hearted though it has been, indicates this process may already be underway. The United States and China have progressed from trying to shape each other’s positions on bilateral issues to competing to influence world order. Whichever nation prevails in this arena can magnanimously shrug off minor setbacks in its foreign relations. Whichever fails will have little to celebrate even when it gains international objectives. China enters the arena crippled by its ideology, but with a clear sense of its interests, capabilities, and strategy. The United States is better equipped and probably has most of the spectators on its side, but it sits alone on a bench in the locker room, gobbling burgers and watching TV, unaware that the game is underway and its opponent is racking up points, oblivious to the bleacher stomping of the restless crowd. How long can America persist in ignorance before it is irreparably diminished?